If you have ever been in the situation where your client has desired a Veneer finish, but not been able to stretch the budget to meet the cost of a true veneer, well here is your solution! 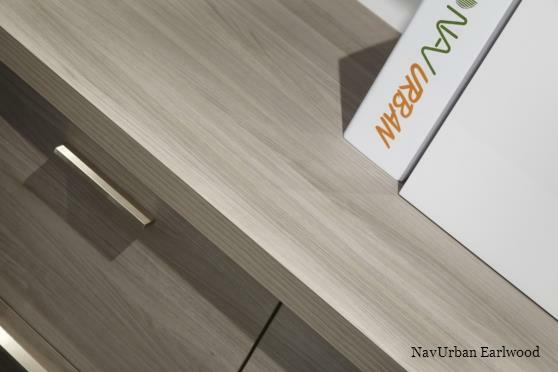 In the paradox of urbanisation and life quality, both now and in the future, NAV URBAN has combined the latest technology and design trends without forgetting the renewable roots of traditional wood-based materials. Incorporating market leading technologies from Japan, NAV URBAN is a range of decorative panel products that not only look great, but have minimal impact on future generations while improving the quality of the environment where they are used. NAV URBAN is a hard-wearing, non-porous, decorative surface that is created with advanced embossing and texture capabilities using an Olefin Film. It has high levels of UV, scratch and abrasion resistance, is bleach cleanable and can be adhered to substrates using low VOC’s. NAV URBAN can be produced in sheets of 3600mm x 900mm or 1200mm, thus allowing for minimal joins and seams once installed. NAV URBAN has a repeat in the vertical pattern every 1300mm, and being an Olefin film there is 100% consistency between each sheet. An indicative price guide for NAV URBAN is $70 -$80 a square metre (G1S), which makes NAV URBAN considerably more cost effective than most veneers or veneer laminates. Matching ABS edging for each decor is also available in 22mm and 54mm widths. For further information and to view the full range of products on offer from New Age Veneers please visit: www.newageveneers.com.au or contact Guy Interiors. 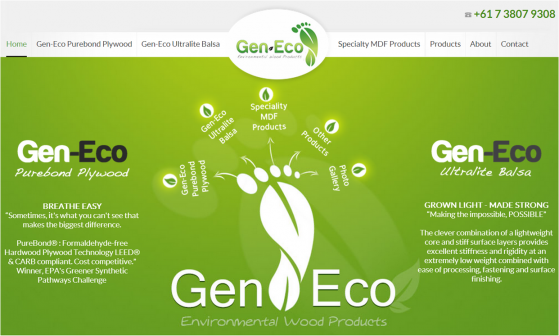 GEN-ECO BAL-Lite is a Balsa/MDF composite panel comprising a Balsa core, available in a variety of thicknesses, which is sandwiched between 3mm Medium Density Fiberboard on both faces. This lamination process creates an incredibly strong, stable and light weight panel ideal for any application which would traditionally use Particleboard, MDF, Plywood or other panel products. The advantage of using GEN-ECO BAL-Lite composite panels is the massive weight reduction and increased thickness range. The MDF face give the panel a clean surface ready for further overlaying with laminates, decorative wood veneers, paper and vinyl overlays, Aluminium or any other material to create the desired look. Applications include, bench tops, furniture components, acoustic panels and decorative ceiling slats, partitioning, wall and ceiling panels, bulkheads, suspended shelving, doors, flooring, and more. GEN-ECO BAL-Lite can be made to order using other face panel thicknesses to your specific requirements. Classic yet original, traditional yet innovative, Art Hide redefines and revolutionises cowhide. In addition to Art Hide offering a divine range of rugs, cushions and lifestyle products, Art Hide also offer a bespoke service where we can customize the hide by size, colour or design to suit any interior space. This flexibility offers clients the opportunity to incorporate a one of a kind masterpiece into any project. The hides are ideal for vertical application, wrapped panels for walls, art, banquet seating and reception desks just to name a few. 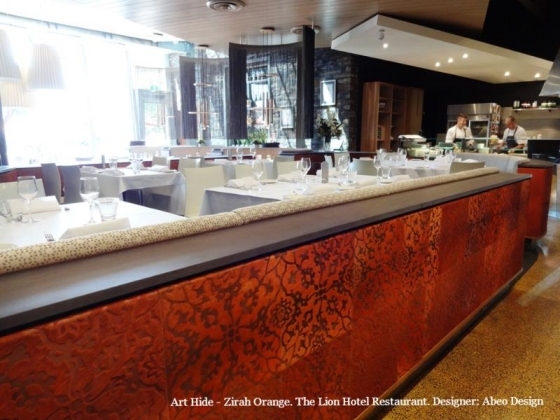 Recently Art Hide teamed up with Abeo Design for the refurbishment of the Lion Hotel Restaurant in North Adelaide. The inclusion of Art Hide's bespoke cowhide designs brings an added uniqueness and warmth to the interior space. Art Hide represents quality in its design and manufacturing methods.